#oneaday, Day 9, Tom yum soup rules! First of all, hello to my subscribers, and also to my casual readers. I was very happy to have start moderating comments today, and I hope you found my answers useful. It’s been a busy weekend readers. Worked late on Friday then had a few drinks with the neighbours. Saturday was breakfast with a hungover wife, then the quest continued to obtain a Wii controller with which to play GoldenEye. Following my post on Friday about needing to find one, I searched every conceivable shop in Devizes where I work to no avail. There is no games shop in this small Wiltshire market town, but I tried electronics stores and supermarkets (3). Nothing. I found this very frustrating, but I don’t live there. Surely Chippenham would give me better success? Sunday morning we got up and went off ‘to do something’** and so we trundled off to look at a White Horse – a peculiar feature of Wiltshire. 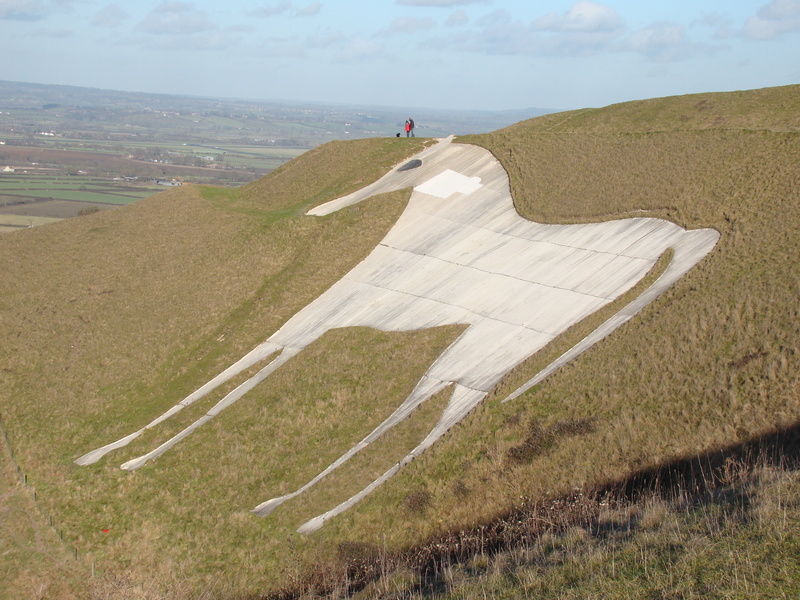 Carved out of chalk hills, although the one we visited was actually white painted concrete. It was breezy up on that hill, and as we headed home in time to do some grocery shopping (I never said we got up early) I was desired for the ingredients for Tom Yum soup – a very fragrant Thai soup, which requires lemongrass, galangal, birdseye chillies, kafir lime leaves, fish sauce, spring onions, lime and coriander. Aside from the galangal and maybe the kafir lime leaves, I was confident I could get all this stuff in Sainsburys. HOW WRONG WAS I? The answer is – a bit. No fish sauce. No galangal no kafir lime leaves. I was mildly peeved. However, they did stock a Tom Yum soup paste, which it turns out makes a pretty good version, even if I do say so myself. Wife also impressed – good job! I would still like to make it from scratch, and I did add fresh lemongrass and coriander. and the lack of decent shopping where I live is beginning to disturb me. Could this actually mean that they were right in the 80s, and Queensgate, Peterborough is the capital city of shopping? A disturbing thought for us all…. * Well, Peterborough. Small city living. This entry was posted in food, games, one a day and tagged food, ON, shopping, wii, wiltshire by doobarz. Bookmark the permalink. So whats verdict on Goldeneye then? I like it. Need to sharpen up though if I am going to get it done on 007 Classic – where health does not regenerate. do need a control pad though….